5월 26일 어제, 제 1회 서울드랙퍼레이드는 조직위원회나 특정 단체 및 개인 덕분이 아니라 다양한 방식으로 응원을 보내주시고 참여해주신 '모든 분들' 덕분에 성공적으로 개최되고 마무리될 수 있었습니다. 이렇게 온라인 상에서 글을 통해 인사드리고 있지만 한 분, 한 분께 감사의 말씀을 드리고 싶은 마음이굴뚝같습니다. 저희 조직위원회는 당초 50명-100명 규모의 작은 행사를 생각하며 기획을 시작했는데, 그 10배, 20배에 달하는 총 인원 1,000명이 행사에 참가해 주셨습니다. (퍼레이드 참여 인원 500명 + 부스행사 및 애프터파티 1부 & 2부 참여 인원 합산) 예상 외로 규모가 커진 만큼 행사 진행과정에서 미흡한 점도 많았으리라 생각합니다. 앞으로 더 체계화 된 기획과 전문적인 도움을 통해 더 많은 사람들이 안전하게, 또 재미있게 즐길 수 있는 많은 행사를 열어나가도록 노력하는 서울드랙퍼레이드가 되겠습니다. 다가오는 6월에는 클럽 및 주류 판매 업소 입장이 불가능한 미성년자들도 즐길 수 있는, 그리고 청소년 성소수자를 위한 후원금도 마련도 하기 위한 "술없이도 재미난 자선 드랙쇼"가 열릴 예정입니다. 자세한 행사 내용은 확정되는대로 저희 웹사이트와 소셜미디어(SNS)를 통해 알려드리도록 하겠습니다. 다시 한번 감사의 말씀 드리며, 너무 지루하고 길어지기 전에 글을 무리 하겠습니다. 다가오는 주중에 퍼레이드 사진들과 뉴스 기사들 또한 공유해드리도록 하겠습니다. 활기찬 월요일, 행복한 한 주 되시길 바라요! We would like to thank EVERYONE who supported the first Seoul Drag Parade and participated in it. We could not have hosted such an event so successfully yesterday without the love and support from all of you. 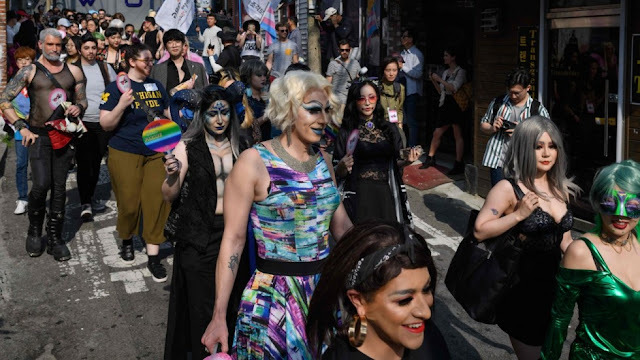 The total number of participants is approximately 1,000, as about 500 people attended the actually parade, and more people participated in booth events and two after-parties. Expecting more people in our next parade, we will be getting more professional help and better-designed organising system. We are planning to have a charity drag show where minors and youth can come and meet local & international drag artists in June. Through this "fun show even without alcohol", we will also be raising a fund for homeless LGBTQ+ youth. Details are to be announced via our website and social media. We wish you had a peaceful and restful Sunday, and have a great week!